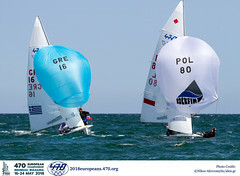 The Women’s 470 fleet were the only sailors to race two races at the Qingdao Olympic Sailing Center on Friday. 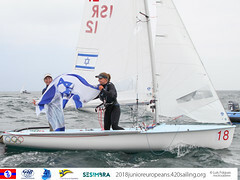 European Champions Sylvia VOGL and Carolina FLATSCHER (AUT) and Israel’s Nike KORNECKI and Vered BUSKILA made the most of the opportunity, stealing the show in the 9-11 knot north northeasterly winds out on course area D. Elise RECHICHI and Tessa PARKINSON (AUS) are back in the overall lead, adding to their consistent scoreline with finishes of second and fifth today. KORNECKI and BOUSKILA are proving to be the surprise package of this year’s Games and a 3,1 for the day moved them up into third place overall, just seven points behind second place Marcelien DE KONING and Lobke BERKHOUT (NED). 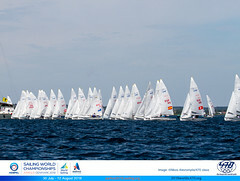 The Dutch team suffered a dip in form today, with 10, 7 scores putting them nine points behind the Australian leaders.